Learning a complex new subject matter often takes extensive practice. Development of expertise requires many hours of practice. Malcolm Gladwell in his recent book Outliers emphasizes how it takes about 10,000 hours of practice to achieve mastery in a field. The research behind this claim comes from studies done by John Hayes who found that geniuses in various fields produce their best work after 10 years of apprenticeship (which works out to about 10,000 hours); and by Ericsson, Krampe and Tesch-Romer (1993) which found that the best violinists practiced 7,000 hours before coming to a Berlin music academy, whereas the good violinists practiced only 5,000 hours. It takes about 3 years for London taxi drivers to acquire the “knowledge” of London in order to expertly navigate through the streets. It takes time to learn to learn the patterns, rules and problem-solving strategies for a domain of knowledge. It is not any kind of practice that will help you become an expert – but deliberate practice. In this type of practice you are not just performing, but trying to learn how to do it better. Learners are usually highly motivated so when given feedback on their performance, and they carefully monitor their work to reduce differences and master the performance. Julia with mallet - beware! Part of deliberate practice is making mistakes and adjusting. 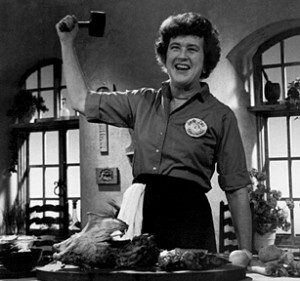 I put this picture of Julia Child here as an inspiration. She is someone who learned to cook and become and expert in her field, through trial and error — doing it over and over again. And every meal was a test, and her diners without doubt gave her feedback. We should all be so fearless. Learners forget new information with time, very rapidly within the first day, and then less so over time. Testing learners has shown to help improve retention and recall. Therefore tests can be used not just for assessment, but as a study mechanism. In studies by Landauer and Bjork (1978) they found that testing individuals after a delay creates a sufficient level of difficulty that requires learners to work harder, thus improving their recall of an series of items. However, this was followed up Karpicke and Roediger (1979), who found that yes, creating a delay helped, but what helped more was giving people feedback after testing, therefore one could test at regular intervals, and provide feedback, and it would have the same effects. It should be remembered that many of these experiments were done in the laboratory, on recall and retention of word pairs, so although likely useful in the “real world”, I have not seen field research verifying these experiments. Practice, give feedback, test, give feedback and practice again. This guideline, like many of the others I have written about, should intuitively make sense. Perhaps in a context where compliance is an issue, the testing, practice, feedback cycle will be helpful (hopefully one can make it fun and not too onerous!) But being motivated, deliberate practice is the key to deep learning and expertise. Posted in guidelines, instructional design. Tagged with cognition, guideline, instructional design, julia-child, practice, test.